You see, I kind of have a slight lemonade obsession. I don't remember when I exactly fell in love with lemonade, most likely somewhere in between the family cook-outs and summertime picnics with friends, but I know I fell hard. Is that weird?! To love a drink so much?! And do I even care if it is?? I'm going to go with not really. I mean, it's so freakin' delicious! And it goes with everything. And the frozen concentrate is almost, almost, better than ice cream (Please tell me I'm not the only one who eats frozen lemonade concentrate straight from the can!!). And you can do so much with it. And it can be a million degrees out in the Sahara desert but it totally refreshes you. I mean, are you getting what I'm saying, or am I just making things weirder?? Yup?? Ok, cool. Like all good obsessions, there comes a point where they start to creep into all aspects of your life. So of course it makes sense that lemonade would find its way into my food. 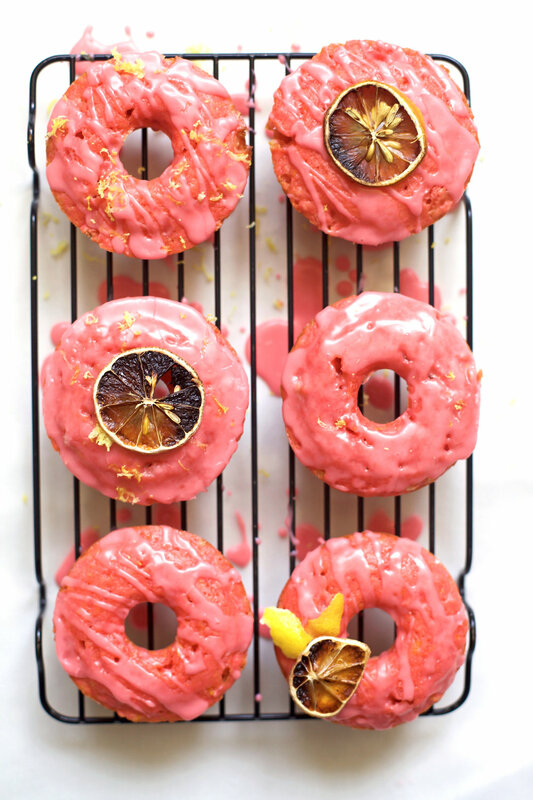 In my latest post for Sugar & Cloth, I took lemonade, pink lemonade to be exact, and made it into these super summer-y, super delicious, super citrus-y, super pretty pink donuts. I mean, pink lemonade donuts??! Are these not the most perfect summer brunch/tea/snack/breakfast/EVERYTHING food??! While I certainly love me some Queen Bey tunes, I guarantee you that when I'm talking about lemonade this summer, music will be the farthest thing from me mind. But can you really blame me? !